Are you studying your "Killion" or "Killian" ancestors? Great! Are you of IRISH descent? You've come to the right place!!! This page collects ancient, historical and modern references on the Irish Killion/Killian surname. Are you of GERMAN descent? Do you have a long history in the UNITED STATES, but don't know where the story starts before that? Or you aren't sure where your ancestors came from? James Green hosts a very extensive website on Killian and Killion genealogy specializing in research in the United States, and also in German ancestors. Try this website on Andreas Killian, a German immigrant who is the ancestor of many U.S. Killians. There is an extensive, searchable database of Killians and Killions, maintained by George W. Killian. Some 50,000 names are said to be on this database, most involving descendents of Andreas Killian. Ancestry discussion forum on "Killion"
Ancestry discussion forum on "Killian"
There is a lively e-mailing list for persons doing research on German and U.S. Killi*n's. It's all free of course, and noncommericial, and very interesting. To get on the mailing list, send an e-mail message to KILLIAN-L-Request@RootsWeb.Com and in the body of the message include the single word "subscribe" (without quotes). Are you just starting your own research? Here is "Kev's Genealogy 101", a write-up giving tips and hints that have worked in my own research. I hope they are helpful to you, too! I'd welcome any contributions you'd care to offer, or to provide links that may be appropriate. Sources on Killions in the U.S.
Two of the classic sources of information on Irish surnames are the books by Rev. Patrick Woulfe and by Edward MacLysaght. - O Killane, Killane, Killan, Killian, Killion; 'descendant of Cillean' (diminutive of Ceallac); a var. in Clare and Galway of Ó Cillín, q.v. - O Killine, O Killen, Killeen, Killen, Killian, Killion; 'descendant. of Cillín' (a 'pet' diminutive of Ceallac, war); the name of several distinct families in different parts of the country, as Clare, Galway, Mayo, Westmeath, Offaly, Kildare and Down, in all of which it is still extent. Ó Cillín, anglicized Killeen, usually without the prefix O, belongs both by historical association and by present day location to the west of Ireland, being found in the three Atlantic seaboard counties, Clare, Galway and Mayo. In successive centuries - 1143 (Four Masters), 1585 (Composition Book of Connacht), 1655 (Book of Survey and Distribution - Killeens are recorded as residing at or near Ballykileen which is in the parish of Annagh, Co. Mayo, while more than a century later in 1783 the Galway Wardenship Mss. record Killeens as resident at Ballinrobe in the same county. The surname first occurs as early as A.D. 964 in the person of Cormac O'Killeen, Bishop of Clonmacnois; in 1106 his namesake was archdeacon of that diocese; in 1026 Conell O'Cilline is recorded as succesor of Cronan of Tuamgraney, Co. Clare. Some families which crossed the Shannon and settled in Co. Westmeath use the form Killian. Woulfe is usually reliable and accurate but I think he might be mistaken in equating Killen with Killeen. Killen is probably simply MacKillen without the prefix. Both these belong chiefly to Antrim, the Irish form being MacCoilín or MacCailin, a galloglass family brought from Scotland by the O'Donnells in the fifteenth century. It is true that the enumerators recorded O'Killin as one of the more numerous Irish names in Co. Down in 1659, but they frequently confused the prefixes O and Mac and it is more probable that the family so described were really MacKillens. In north-east Ulster MacKillen may be confused with MacQuillan (see Irish Families, p. 250). There were several mediaeval ecclaisiastical dignitaries in Connacht called O'Killeen. In our own time Dr. John Killeen, Bishop of Port Augusta (now Port Pirie), is remembered for his help in combating the "Black & Tan" campaign. Two Belfast men, Rev. Thomas Young Killen (1826-1886) and Rev. William Dore Killen (1806-1902) were notable as leading Presbyterians; also from Co. Antrim was James Bryce Killen (1845-1916), the Fenian and cofounder with Michael Davitt of the Land League; another Fenian was the New York lawyer Dorian Killian; and going back to an earlier insurrection there was John Killen, who was most unjustly hanged in 1803 for his alleged complicity in Robert Emmet's attempt. Today, we take great pride in our names and we take pains to make sure that they are spelled "correctly". Genealogy does not allow such precision. For all practical purposes, Killion, Killian, Kilian and related variations should be taken as indistinguishable. For poor farmers in 19th century Ireland and earlier, illiteracy was commonplace, and English (and thus Anglicized spellings) was often a second language, after Irish. Church and civil records were often posted by the priest or registrar pretty much as he heard them. Even for successive births within the same family, the surname may be entered in records in several different spellings. Upon immigration into the United States, many of our ancestors also had their names revised in the process, through accident or through intent of either the immigrant or immigration officers. Thus, don't be surprised if your Killion ancestors turn out to be Killians, or vice versa! The Killion/Killian name (and other similar variations) is not a terribly common one in Ireland. From the point of view of genealogy, that's extremely convenient. It makes it possible to focus research attention on a smaller area. The most common 19th century locations for our name are the midland counties of Roscommon, Westmeath, Longford and Offaly (roughly in that order), and also Galway and Mayo. The name "Killen" is also found in counties Donegal, Antrim, Down, Kildare and Tyrone. This map shows the mid-19th century distribution of the Killi*n name in Co. Roscommon, which appears to be the county where our name was most prevalent. Click to see a full-size view, and then use your browser's Back button to get back here. This filing is on behalf of three men, including a Thomas Killian, all from the parish of Moore, at the southern tip of Co. Roscommon. The three had been sentenced to death, and were imprisoned in Roscommon Gaol. The petition asks for an extension of a period of clemency, and includes character testimonials from a number of other men of the town. There does not appear to be any information as to whether any relief was granted. Family: "Convict has a wife and nine children (eldest aged 12 years)"
"To his Excellency, the Right Honorable Earl Forescue, Lord Lieutenant General and General Governor of Ireland. "... afflicted wife and nine children, the eldest in the 12th year of her age, solely dependent on [my] industry for the means of support and future prospects." "... your petitioner has a wife and nine small children seven whom are unable to make any support for themselves and four of them females all depending on your petitioner's industry and scanty earnings heretofore all whom will be ruined during this hard season if your Excellency is not pleased take your petitioner into your favorable consideration and order that your petitioner sentense be mitigated. "Your petitioner being reduced to a low station in life was not able to bring evidence from Naas..."
This document has no further information on what became of James Killian, or if he was transported. Most likely, "Naas" (pronounced Nace) is the town in Co. Kildare. There is a large area in Naas called Fairgreen that would be a likely place for the fair to have been. We could find no place named "Robinstown" near Naas, but there is a Robinstown in Co. Meath, and Mullingar is nearest big town. So, perhaps we can guess that James Killian was from the Westmeath or Meath area, and was accused of stealing the cow from that area and taking it to Naas to the fair. The multi-volume "Famine Immigrants" collects passenger lists from ships that sailed during the Famine years. Here are Killion's that are listed on those sailings. (Apologies to any Killians reading this; when I copied this some time ago I only recorded the "-ion" entries.) Of course, be aware that sources like this cannot be considered flawless, perfectly accurate or complete. Biddy Killion 12 F "unknown"
Biddy Killion 17 F "unknown"
"At Carihaken the levellers have been at work, and tumbled down eighteen houses. 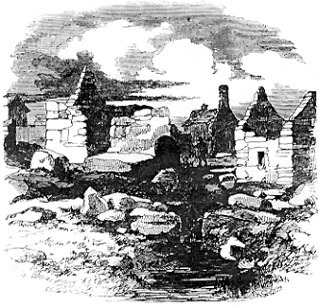 In one of them dwelt John Killian, who stood by me while I made the accompanying sketch of the remains of his dwelling. He told me that he and his fathers before him had owned this now ruined cabin for ages, and that he had paid £4 a year for four acres of ground. He owed no rent: before it was due, the landlord's drivers cut down his crops, carried them off, gave him no account of the proceeds, and then tumbled his house. The hut made against the end wall of a former habitation was not likely to remain, as a decree had gone forth entirely to clear the place. The old man also told me that his son having cut down, on the spot that was once his own garden, a few sticks to make him a shelter, was taken up, prosecuted, and sentenced to two month's confinement for destroying trees and making waste of the property." This section includes details about Killi*ns in Ireland identified as ancestors by present-day researchers. If your Killi*n ancestor came from Ireland, I'd love to add your info to this section! I am researching descendants of Maurice Killian (1810-1895), who brought his family from Ireland to Cattaraugus Co, NY in 1848. His wife was Bridget (Flood) Killian and their children were Patrick, Margaret, Catherine, Christopher, Bridget, Mary and Daniel. Searching for Joseph M. Killian, Born 1845 in Boston. Parents were John M. Killian and Delia S. Churchill. Also had a brother, Edwin or Edward S. Killian, born 1854, died in Michigan in 1874. May have brothers Thomas F. and Richard A.
THOMAS KILLIN born in or near the market town of Mullingar in the parish of Mullingar around 1787. He was enlisted in the South Cork Militia on 21st February 1809 by Commanding Officer Hayes St. Leger but he volunteered to join the 43rd Regiment of Foot, 2nd Battalion, on 10th May 1809 in Killarney, Co. Kerry. He fought in Spain in the Peninsular Wars and retired to a pension in 1824. He married ELIZABETH NOON from Roscommon and they moved to Congleton Cheshire (where first son James was born), and then to Coventry in Warwickshire. He was a silk weaver by profession. Thomas may have had a brother called William, whose son John was born in Dublin around 1819. In his pension records from the Royal Hospital, Chelsea, his name is given as THOMAS KILLEN (although his signature appears to be Killin) and he appears in Muster Rolls under a variety of spellings, such as Killings, etc. Any help would be greatly appreciated.� Contact email: s.berkshire@lycos.com. Patrick Killion born 1850 (Turrock towland) to Thomas Killion and Mary Lawlor. Patrick may have had a sister Margaret born in 1852. Patrick married Bridgit Mulligan from Carrowntarrif in 1879 in Dysart Parrish in Turrock. They had a son Thomas that was born in 1880 born in Townlad of Turrock. 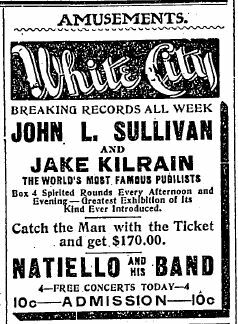 Jake Kilrain, famous boxer, fought 75 rounds with John L. Sullivan in 1889. He was born Joseph John Killion in Greenport, Columbia Co. NY on Feb 9, 1859. He died Dec 22, 1937 in Quincy, Mass. His death certificate states that he married Elizabeth M. Hoar, and that his father's name was John. M. Killian, born in Ireland. Sentenced to Life (Transportation, 10 years) for 'assaulting the habitation', March 1, 1833. Send your info to be added to this list! This section is to record extra notes about references to Killions and Killians from Ireland. Source: "Virginians and West Virginians 1607-1870", an index to "History of West Virginia, Old and New, and West Virginia Biography, published by The American Historical Society, Inc., Chicago and New York 1923. Also, "more info in Vol. 2, page 143", but I don't have that reference. Click on that website shown above for more info. James Greene runs an extensive website on Killians and Killions in the U.S. and those descended from German ancestors. Official Killian's Red Ale website of Coors Brewing. Here's part of what they say about this beer: "Traditional lager with an authentic Irish heritage, based on the Killian family's recipe created more than 135 years ago in Enniscorthy, Ireland." Coors offers some Killians logo for sale on their website. 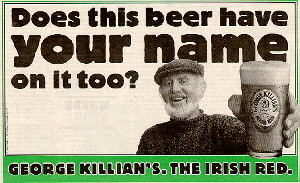 As much as one could reasonably want to know about Killian's Irish Red. About two dozen pictures involving Killian's Red Irish. Yikes! Yet another tribute page to GKRIA. Molecular Expressions: The Beershots Photo Gallery - George Killian's Irish Red Lager: This page illustrates how crystallites of the beer George Killian's Irish Red Lager appear under a polarized light microscope. Kilian Community College, Sioux Falls, SD (first president was Dr. Thomas Kilian). "At Kilian Community College we know you by name, and we like it that way!" J. J. Killeen's Pub, : I had to add this to the page if only because this sounds like one fun place! Try clicking on some of the pictures, and imagine having a pint with some of these folks! Peggy McLaughlin told us about it: "You might want to add Killeen's Village Tavern, Shannonbridge , Co. Offaly to your list of Irish places related to the Killeens. I believe the Killeen family�who run the pub were born in Moore, Co. Roscommon (Shannonbridge is just across the Shannon River from Moore)." Many Killion's are from County Roscommon, so the Leitrim-Roscommon Home Page can be a very valuable source of information. That website carries surnames being researched, lists of townlands, and maps of parishes, baronies and poor law unions. If your ancestors were from either of these two counties, this is a must-see location! Death records for many Americans is available in the government's Social Security Death Index. Ancestry, Inc., provides this online at their website. In Würzburg there is a very nice old bridge across the river Main (pronounced "mine") on which there are twelve statues from different saints. Of course Kilian - as the city-saint - has a good place there. A large view is also available. This modern statue of St. Kilian is beneath the Kilian Dom (church) in Würzburg. St. Kilian is seen portrayed standing in a boat in his journey from Ireland. The ship can also be interpreted as a symbol for the church. A large view is also available. St. Kilian was an Irish missionary of the 7th century. Today he is best remembered in Germany, where there are many churches and places named for him. So, there may well be some ancient shared heritage between the Irish Killi*ns and German Killi*ns! There is an interesting website devoted to St. Kilian (and his hometown of Mullagh in Co. Cavan). Kilian of Würzburg, St., bishop and martyr; b. Ireland (according to strong local tradition, at Mullagh, County Cavan, Ireland), c. 640; d. Würzburg,, Germany, July 8, 689 (feast, July 8). 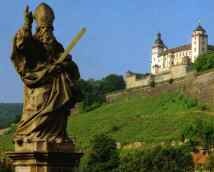 According to the older and more trustworthy passio he was already a bishop when he left Ireland with 11 companions and reached the residence of the pagan Thuringian Duke, Gozbert, at Würzburg. Having decided to evangelize this region, he reputedly traveled to Rome for papal approval in autumn 686. The account of this journey and of his meeting with Pope Conon is certainly unhistorical. He converted many in Franconia and Thuringia, including Duke Gozbert, whom he persuaded to separate from Geilana, his brother's widow. In revenge Geilana had Kilian murdered along with two of his fellow missionaries, the priest Coloman (Kolonat) and the deacon Totnan. Their relics were solemnly transferred by Burchard, first bishop of Würzburg, to the new cathedral on July 8, 752, and are now enshrined in the Neumünster, erected over the spot where, according to tradition, the martyrdom took place. Much controversy has centered on the dating and reliability of the Passio Prima and Secunda that deal with the saint's life, but A. Bigelmair dates the Passio Prima to 752 and accepts it as historical, though with an accretion of legend. The new online version of the Catholic Encyclopedia has a lengthier article on St. Kilian. This outpost is located across the Main River from Wurzburg, high on a hill with a moat. This installation is known as the Marienburg Fortress and has been refurbished so that it is a marvelous tourist attraction. ... 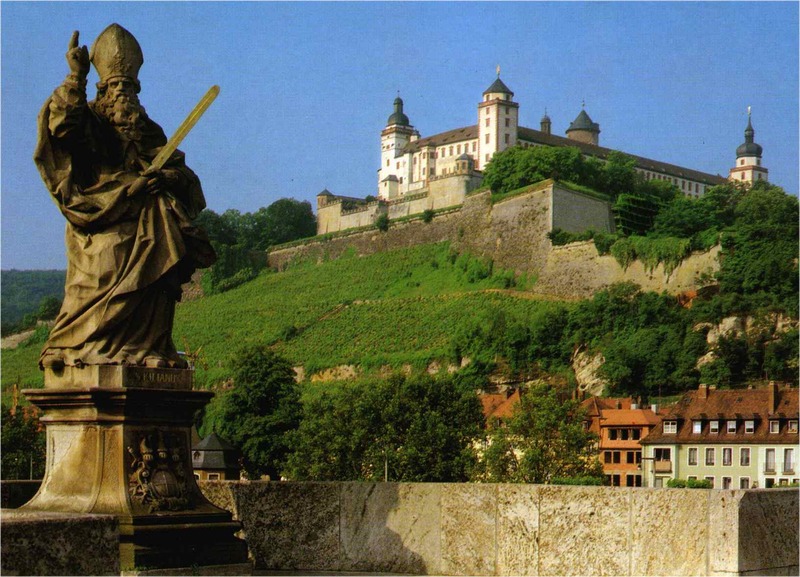 There is a large statue of St. Kilian on the Marienburg Fortress, another large Statue on the old bridge from Wurzburg over the River Main to the Marienburg Fortress, and another Statue of St. Kilian on the Neumunster Church in Wurzburg where the St. Kilian Crypt is located. This is said to be over the location of the martyrdom. There is a St. Kilian Cathedral in Wurzburg and another St. Killian Cathedral in Heilbron. Both of these structures are beautifully done. There are quite a few Kilians and a lessor number of Killians in modern German cities. When the common men started using last names in the period 1200 to 1300, I suspect that a number of them took the name of their Church for their last names. This is pure speculation of course. KILIAN of Aubigny, St., Irish hermit in France; d. 670 (feast, Nov. 13). Little is known of the career of Kilian (originally Chillen). He is said to have been returning from a pilgrimage to Rome when he met St. Faro, Bishop of Meaux, who found him a site for a hermitage at Aubigny near Arras. Here Kilian spent the rest of his life and was later venerated as a saint. 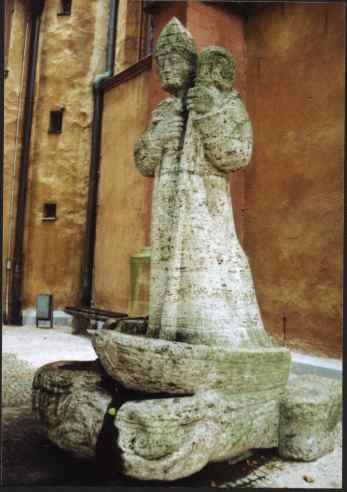 The same St. Faro was responsible for settling the Irish St. Fiacre in the same part of France. Here is a link to one more webpage about St. Kilian. There is an independent movie that may well be of interest to those reading this page, "Kilian's Chronicle". The promo says, "Five centuries before Columbus, a Viking ship was lost on these shores. To find their way home they needed the navigating stone, stolen by Kilian, the Irish slave, who escaped from their ship. This film tells the story of Kilian's flight to freedom and his encounter with the original people of America." Pamela Berger, the producer of the film, reports that it has now been retitled (darn it!) as "The Magic Stone", and it is now distributed by Amazing Movies (7471 Melrose Avenue, Los Angeles, CA 90046, (213) 852-1396). A famous opera figure is the farmer Kilian in "Der Freischuetz" of Weber. The most well-known "Killi*n" character on TV is probably that of "Jack Killian", played by Gary Cole, on the television series, "Midnight Caller". There are at least two websites (here and here) devoted to information on that television series, which aired on NBC between 1988 and 1991. Richard Evans wrote to tell us of a late friend of his, Leo Killion. This Mr. Killion achieved his moment of fame by writing the "Hut Sut Song", which sold millions of records as one of the novelty songs that were quite popular in the 1930s. It was recorded by Les Brown, Kay Kayser and a dozen other orchestras, and was mentioned in the movie "Going My Way" and much later on the TV series "Winds of War". Thanks for the info, Richard! This page is maintained by Kevin C. Killion. Any tips or comments are very welcomed! I'd love to post any info you'd care to add to this page. Go to my list of names I'm researching. Go to my "Genealogy 101" page of tips and hints that have worked for me. Go to my home page (lots of other subjects).